I’ve been running around the Leavenworth Alps for the last 12 years and been fortunate enough to summit a lot of the major peaks in the area, with the glaring exception of Colchuck Peak. For some reason, I just hadn’t taken the time to top out on this one, even though I’ve been in the general area a bazillion times, in summer and winter, rain, snow and sunshine. 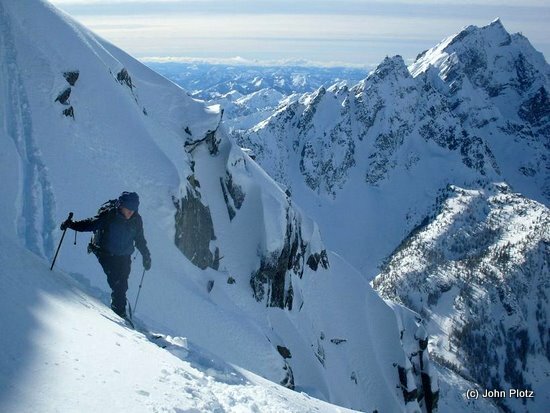 I’ve been to Colchuck Col a number of times, but never had the motivation to run up the easy ridge to Colchuck’s summit. 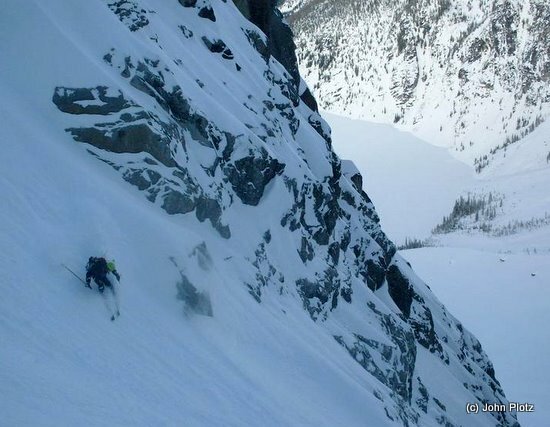 This omission changed this past weekend when Kyle Flick, Scott McCallister, Will Terrano and I skinned up to Colchuck Lake for a weekend of powdery fun. Mission Ridge had received at least 8 to 10 inches of snow the day before we planned on starting up. Colchuck Lake sits around 5,500′, and is situated further west than Mission. So, I suspected this would mean a foot or more in the upper elevations. Great for skiing, but bad for cutting a trail up to our camp spot. Fortunately, we were four workhorses ready for the task, which as it turned out, started right at the roadhead. We slogged and fought 12 to 15 inches of powder that was on the heavier side due to warmer temps, all the way up to the lake. We quickly shed our overnight gear at our camp site, and dashed off across the frozen expanse of Colchuck Lake, with the twin ogres of Dragontail and Colchuck Peak looming far overhead. More exhausting trailbreaking ensued, though it did improve as we were able to make upward progress over solidified avalanche debris up higher. This debris was evidence of natural-release slides, large ones with impressive crowns. This kept us on edge, but confident that most of the pent up slope energy had been released during the most recent storm. A quick pit up high confirmed excellent bonding between layers, with no discernible slide layer in the column we tested. 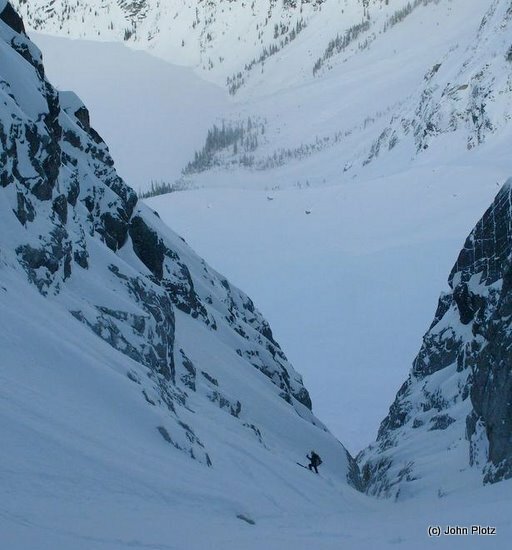 At Colchuck Col, Kyle quickly turned and skied back down, as he was due back home that evening. Will, Scott and I continued up to Colchuck’s false summit before clouds and darkness forced our own retreat back to camp. A full moon blessed our night, creating enough light as if a car were parked just outside the Megamid with its highbeams on. My 2am bathroom break had me in awe at the luminescence of the surrounding peaks and the new-fallen snow. Despite the frigid cold, I stood out there experiencing this natural wonder for as long as my numb toes and fingers could stand it. Morning came mostly clear and calm, and Will and I decided to check out a couloir on Colchuck Peak while Scott decided to stay and nurse his hip flexor. Progress was made much easier Sunday by our broken trail from the previous day’s labor, and within a couple hours we topped out on Colchuck Peak, my first time on its summit. Photo: Touring toward Colchuck’s summit. 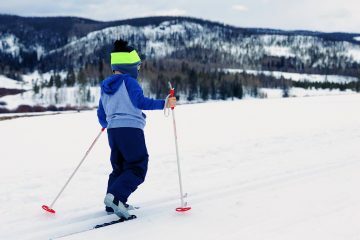 Ski descent protocol usually mandates that any ski descent must first be climbed. This way, the skier knows first-hand what the snow conditions are like, and whether the route is actually ski-able. But this day, Will and I cheated and took the back side up Colchuck. We broke protocol to avoid wallowing in a foot and a half of powder all the way up the route. While this is not ideal, we made an educated guess that the route would be in decent shape based on what we observed from the previous day. And if it weren’t ski-able, we had the correct tools to climb back out of trouble. The entrance proved to be icy and crusty, causing an immediate visceral reaction in my stomach. I made one very stressful turn and skied over the breadth of the steep slope to a more northerly aspect and found…powder! Will followed suit, and I made some cautious turns down to a band of cliffs, striated with runnels of powder. We side-stepped this section with much caution, as the slope below continued very steeply, doglegging out of view way below. Photo: Powder and exposure — life on the edge. The runnel eventually ended at an icy bulge. From here, it was painfully obvious that we would have to “air-it-out” a bit to get off this beast of a couloir. The drop was only 4 or 5 feet, but the landing was still very steep. Being the guinea pig, I inched gingerly towards the edge and hopped forward. The landing was firm yet just soft enough to self-arrest to keep from ping-ponging down the rest of the route. Thankfully, Will also stuck the landing. Many steep, wonderful soft turns followed. The NE Couloir constricts about 3/4 of the way down, to about the length of my 187 Manaslu’s. I know, because my tips and tails were scratching both walls of the gully! 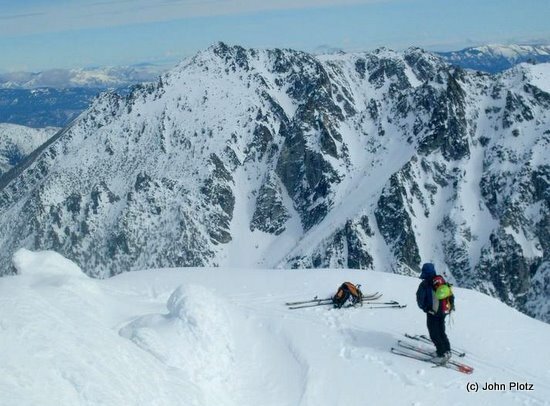 Once out in the open, we shook hands, shaking from adrenaline and congratulated each other on a fine run down a classic peak that’s gained some notoriety over the years. And in my mind I quietly celebrated my first summit of Colchuck! Access. Park west of Leavenworth near the Bridge Creek Campground about eight miles up the Icicle River Road. No parking permits are needed to park here in winter or spring. Note: Doing the trip later in the spring when the Eightmile Road has opened to vehicles and you can drive the first 4 miles of the approach makes the trip considerably shorter. 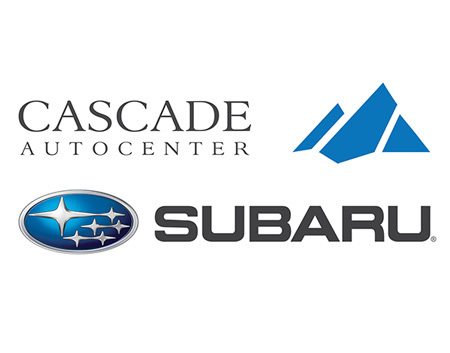 A Northwest Forest Pass is needed to park at the trailhead once the Eightmile Road opens. Approach. Walk and/or ski 4 miles up the Eightmile Road to the Mountaineer Creek Trailhead; then follow the trail to Colchuck Lake. Overnight skiers usually prefer to camp at the south end of the lake. You’ll save time if you visit early enough in the season to ski across Colchuck Lake (on an average year, the ice on the lake starts breaking up around mid-May). More details about the trail to Colchuck Lake can be found in the Hiking guidebook. Equipment. 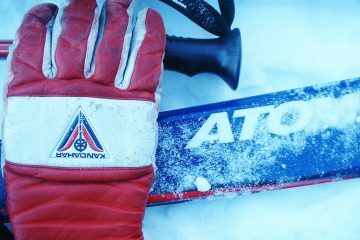 Appropriate ski-touring gear, ice axe, crampons, avalanche gear, and helmet. 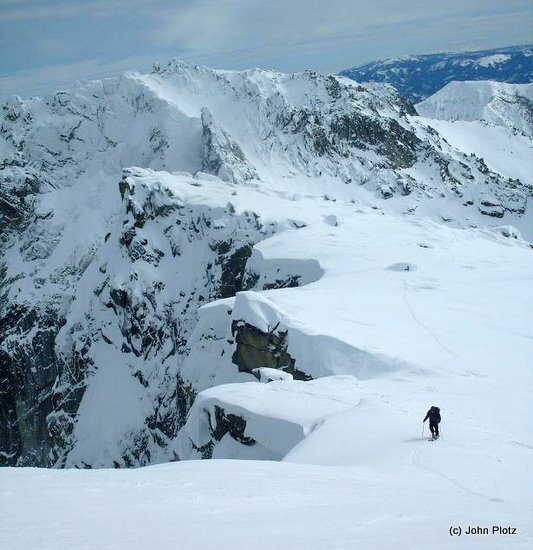 Also consider a smaller diameter rope, anchor materials, and a harness to belay or /rappel crux moves – the consequences of a fall on this route can be severe. Map. Map of approach trails below. Map of ski lines (below) around Colchuck Lake and Aasgard Pass. The NE couloir isn’t marked as a ski line but is the main north-side cleft in the mountain starting east of the summit. Permits. A Northwest Forest Pass is needed to park at the Mountaineer Creek Trailhead once the Eightmile Road opens in late spring. If you’re spending the night at Colchuck Lake, self-register for a wilderness permit at the trailhead. After mid-June, wilderness permits for Colchuck Lake are issued on a restricted basis. More info about wilderness permits.